Oritsetimeyin Agbeyegbe (IndE 1T5 + PEY) and Andrew Forde (MSE 1T1). Though it’s only been two years since Andrew Forde (MSE 1T1) completed his undergraduate degree at U of T Engineering, he has already established a scholarship to support other promising engineers. He hopes to find new ways of sharing scholarship opportunities like these through a partnership with mobile app development company Phoenix BlueMobility. For the next five years, the Andrew Forde Polymath Award will provide financial assistance to an undergraduate engineering student who excels in multiple areas of life beyond academics and is actively engaged in helping to strengthen the Afro-Caribbean community. The inaugural award was presented to Oritsetimeyin “Oti” Agbeyegbe (IndE 1T5 + PEY) at a luncheon on March 22. 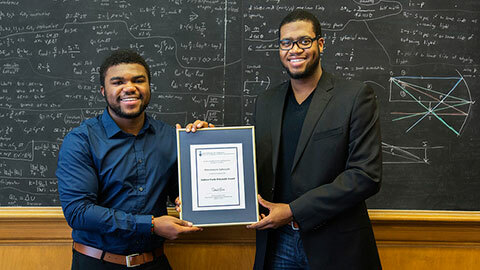 Agbeyegbe was selected for his strong academic performance and his involvement in the U of T Chapter of the National Society of Black Engineers, where he led several initiatives as the pre-collegiate chair. He is currently serving his Professional Experience Year at BlackBerry in Waterloo and plans to pursue a career in software development. Forde is currently president and CEO of Sommerlink Corporation and was the 2012 recipient of the Harry Jerome Young Entrepreneur Award from the Black Business & Professional Association. Read a Q & A with Forde where he discusses the importance of alumni engagement, embracing your talents and how it’s never too early to give back.